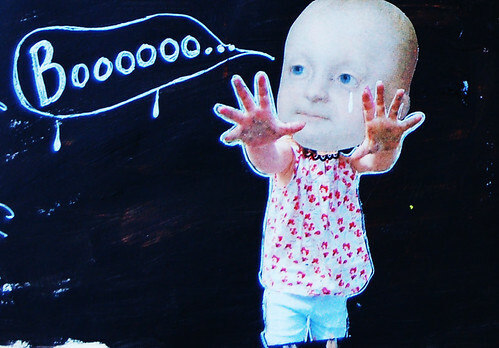 Crying baby – why are you crying? It turned out very spooky I’m happy to say. Both the owl and the bear in the dark cave images are attached with tape in one end so you can flap them up to reveal a “secret” message. Just a little interactive play that I like to do every now and then. 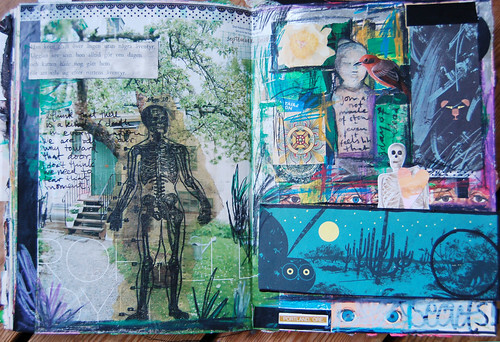 This entry was posted in Art journaling and tagged autumn, black, darkness. Bookmark the permalink. 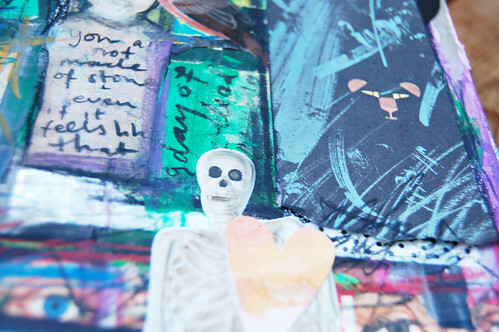 you always inspire me, hanna, to get my journal out and paint, glue, stamp, and write my day away.. these pages are spooky in all the right ways! I’m very interested in your exploration of darkness because it is so different from your bright, energetic works. May I ask, why all this darkness lately? I really like how you’ve put Laundry Day in there! Love this spread! I find the baby really cute, actually! 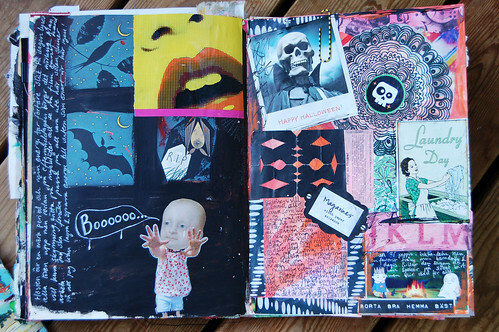 Your art journalling is so much like my mums cooking – she makes it all sound so easy, but then when I try… aaaargh! I love the effect from the white pen and how it makes the baby appear to glow. hej Hanna! Jag gillar verkligen det d?r med art journal. Som dagboksanteckningar fast utan s? mycket ord. ?nskar att jag hade tid och ork att ?gna mig ?t det…. Looks good! And I love having interactive bits in my journals! very dark, i do find it interesting that you put the laundry day clip in the collage. a little darker side of realism. obviously a little inner message from you. The handy baby is so cool. So fun, Hanna! I am thinking much about spooky stuff, even though it’s a month past Halloween!